We’re all born with a stress-coping “savings account” filled with chemicals—such as hormones, amino acids, and nutrients—that can be deposited and then withdrawn when needed. Depending on our genes, some of us have large accounts, and some of us have smaller ones. The more stress we’re under, the more withdrawals we make. If we make more withdrawals than deposits, we get overdrawn, and poor health quickly follows. Individuals with fibromyalgia and/or CFS have bankrupted their stress-coping savings account. Although some patients bankrupt their accounts with one overwhelming event, most experience a series of stressful events over the years. These events typically involve stressful jobs, marriages, family dynamics, surgeries, illnesses, loss of a loved one, divorce, financial failure, etc. Many of my patients can remember the day when their account went belly-up. It might have been after a surgery or following the loss of a parent. Whatever happened, the person was never the same from that point on; she just couldn’t get well. My CFS patients often relate how they came down with a bad case of flu and just never completely got over it. Once these individuals get enough rest and stop making withdrawals, they may attempt to do something as mundane as sweep the kitchen floor only to be wiped out once again. And forget about grocery shopping! That could put them in bed for weeks. FMS and CFS are the result of internal biochemical (hormonal, enzymatic, neuronal, and chemical) imbalances that manifest themselves as physical symptoms (pain, weakness, and mental impairment). So in order to right the homeostatic system, you must correct the underlying biochemical problems. Just like an onion, you peel away one layer at a time until you get to the core. But we’ll discuss these practical steps soon. For now, let’s make sure that you understand all of these “layers of the onion.” One of these is dysautonomia. Dysautonomia is defined by Taber’s Cyclopedic Medical Dictionary as “a rare hereditary disease involving the autonomic nervous system with mental retardation, motor in coordination, vomiting, frequent infections, and convulsions.” But dysautonomia symptoms are usually nowhere near this severe. Dysautonomia patients are more likely to be suffering from mitral valve prolapse and neurally mediated hypotension (dizziness upon standing) than mental retardation and vomiting. A better description, then, of dysautonomia would be a malfunction in the body’s master regulating (homeostasis) system, which—as you may recall from earlier chapters—is known as the autonomic nervous system or the HPA axis. The HPA axis (comprised of the hypothalamus, the pituitary gland, and the adrenal glands) controls millions of involuntary actions such as breathing, releasing of endocrine hormones, blood flow, smooth muscle tone, immune response, heartbeat, detoxification, and elimination. We don’t have to think about breathing; we just do it. We don’t try to pump blood through the heart and into the muscles; it is initiated and monitored by our HPA axis. Normally all the systems in the body speak to and coordinate with one another. This is the essence of homeostasis. But when a person depletes her savings account of stress-coping chemicals, her HPA axis begins to self-destruct. This is dysautonomia. It’s as if the immune system starts to speak in Spanish, the endocrine system in German, the musculoskeletal system in Greek, and the digestive system in French! And when no one can communicate, chaos results! Most of us can handle the ups and downs of our daily lives, even the occasional catastrophe. We dig in our heels, persevere, and eventually learn to cope. However, some individuals have an altered stress-coping system, which prevents them from managing daily stress. Human studies suggest that for some folks, the cumulative effects of physical, mental, chemical, or emotional burdens in early childhood may increase the affects of stress later in life. (It’s possible that the reason for his effect is an overstimulation or dysfunction of the HPA-axis). Retrospective studies show that the stress of emotional, physical, or sexual abuse during childhood also increases the future risk of developing certain symptoms, including many associated with FMS and CFS. Apparently, for some children and adolescents, too many traumatic or stressful events decondition their normal homeostatic stress-coping abilities. Thus stress, particularly traumatic stress, early in life may alter the set point of their stress-response system. As they get older, have more responsibilities, and experience an increase in their daily stress, they often find their health beginning to suffer. They may start to have bouts of anxiety and depression, or perhaps they’re just tired all the time. They become extremely vulnerable to major stressors: the death of a loved one, chronic illness, invasive surgery, physical trauma, etc. Like a ticking time bomb, it’s only a matter of time before they explode. This is especially true for those who have a genetic predisposition that makes them more susceptible to the ill effects of daily stress, including reduced serotonin levels. Some research has suggested that FMS/CFS patients may in fact by afflicted by this genetic abnormality. Sadly, I find that many of my FMS and CFS patients have experienced physical, emotional, or sexual abuse as a child. Some patients report abuse from their spouse (sometimes physical but more often emotional). This stressful situation, though begun in adulthood, can still eventually deplete their stress-coping chemicals and lead to a state of disease. The final tick of the time bomb may be just another part of chronic daily stress, or it may be a sudden traumatic event like the birth of a new baby. I know I didn’t think I’d survive the first colic-plagued six months of my daughter’s life. And I’m extremely healthy! I pulled my weight and spent every other night walking and rocking my crying daughter into the early morning, and this is main reason it took another nine years before my wife could convince me to have another child! It’s no wonder that many of my patients report that their fibromyalgia began after the birth of a child, often a firstborn. Anyone with children can relate to sleeping (if you can call it that) with one eye and two ears open, making sure the baby is breathing. Or how about trying to sleep without moving so that you don’t wake the baby up? Then there’s the endless nights of breast and bottle feedings, diaper changes at two in the morning, and the early morning piercing cry: “I’m awake, folks!” It’s enough to bankrupt anyone’s stress-coping savings account! Whew! Let’s move on. we are all born with a stress-coping savings account filled up with chemicals we need for the body to work properly. These chemicals—serotonin, dopamine, norepinephrine, cortisol, DHEA, HGH, and others—help us deal with stress. Every time we are exposed to stress (chemically, emotionally, mentally, or physically), we make withdrawals from our stress-coping savings account. These withdrawals can be triggered by any stimulus, including sounds (especially loud or irritating noise), odors, and bright light. You may have noticed that the longer you’ve had your illness, the less tolerant you are to certain odors, chemicals, or noises. Emotionally stressful situations cause the body to release adrenaline, cortisol, and insulin, and these stress hormones stimulate the brain to secrete serotonin. Long-term stress and poor dietary habits can therefore deplete the body’s serotonin stores. If we aren’t careful we’ll find that we are making more withdrawals than deposits, bankrupting our own account. And when we do, FMS and CFS are often the result. 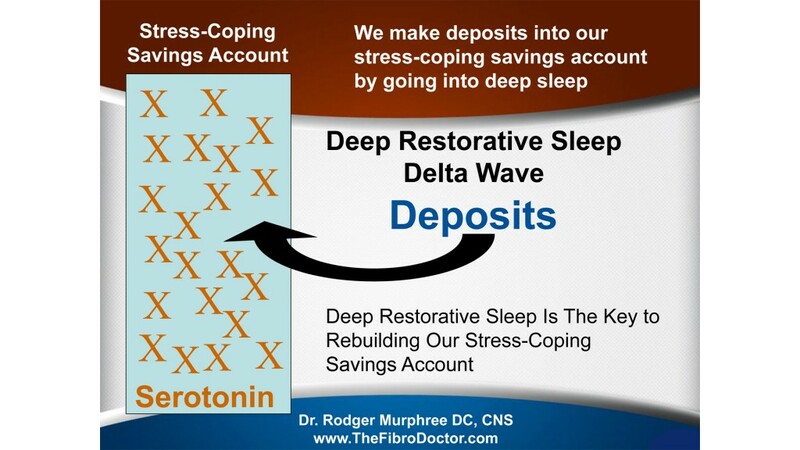 But when a person enters deep, restorative sleep, she makes more serotonin, which then gets deposited into her stress-coping savings account. The more stress a person is under, the more serotonin she’ll need to replenish. It’s a vicious cycle. If she doesn’t have enough serotonin, she won’t be able to go into the stage of sleep in which she is able to make more serotonin! The first reaction of many physicians to a patient’s serotonin deficiency is to recommend a selective serotonin reuptake inhibitor (SSRI) drug. 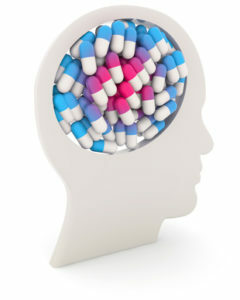 But while prescription antidepressants can be helpful, they have some serious potential side effects (see chapter 6). In addition, they tend not to work for FMS patients. And here’s why: SSRIs can help a patient hang onto and use their naturally occurring stores of serotonin. They work like a gasoline additive would work in your car, helping to increase the efficiency of “fuel.” But most of the patients I see with fibromyalgia are running on fumes! A gasoline additive is not likely to help. If you don’t have any serotonin to re-uptake, then using a serotonin re-uptake inhibitor drug is pointless. And by pointless, I mean exactly that. It’s money thrown away. In fact, depending on which study you quote, from 19% to 70% of those taking antidepressant medications would do just as well on a placebo. This is precisely why I recommend that my fibromyalgia patients boost their serotonin levels by taking 5-HTP, not an antidepressant. Why put an additive in your gas tank…when you can just fill it up with what it’s really thirsty for? The proper function of our adrenal glands is second only to a good night’s sleep in winning the battle against fibromyalgia and chronic fatigue syndrome. The importance of restoring optimal adrenal gland function can’t be overstated. An individual with FMS or CFS who suffers from adrenal fatigue will find her stress-coping abilities to be severely depleted. Simply put, she “stresses out” easily. Consequently, she has to avoid stressful situations in order to just feel OK (which makes for complicated relationships). Stress causes her physical pain, worsens her other symptoms, and can cause a flare-up that lasts well beyond the time of the stressful incident. If she has a day when she feel good, she’ll usually overdo it. Her reason? “I’ve got so much to do! And who knows when I’ll feel good again.” So she cleans the house, stays late at work, re-sods the front yard, goes Christmas shopping, and plays outside with the kids. Then she crashes—hard—the next day. She just doesn’t have any resistance to stress. If her sister calls at 9:00 p.m. with some bad news, she can just forget about sleeping. And of course she’ll feel terrible the next day, so she can go ahead and cancel that lunch date. “But how can I cancel on my friend again? She already thinks I’m avoiding her!” She just can’t make any firm plans, because she never knows if she’ll be having a good or bad day. Below are some sample accounts from patients of mine who have suffered from adrenal fatigue. Does any of it sound familiar? Adrenal fatigue is already known to cause many of the same problems associated with CFS/FMS, such as muscle or joint pain, dizziness, fatigue, decreased mental acuity, low body temperature, a compromised immune system, depression, constipation, diarrhea, and abdominal pain. For the past 14 years, I’ve successfully treated thousands of patients with high does of certain vitamins, minerals, amino acids, and other nutrients—an approach known as orthomolecular medicine (see ch. 7). It’s based solely on biochemistry, using the right chemicals inherently natural to your body’s optimal functioning. In short, by using the natural building blocks that make up your normal biochemistry, we can correct, drastically improve, or even reverse the cause of your illness. Nutrients— including vitamins, minerals, and amino acids—make the hormones that regulate your body. They compose every essential chemical in the body, including thyroid hormone, testosterone, estrogen, neurotransmitters (serotonin, norepinephrine, etc. ), antibodies, adrenaline, cortisol, and white blood cells. Unlike with drug therapy, there is never any danger in getting healthy. Once you become familiar with my protocols, you’ll realize that they’re safer and often more effective than drug therapy alone. And they often work quickly, having a person feel better than she has in years. I’ve found that it’s best to start with the following core nutrients, which I call the Jump-Start Package. 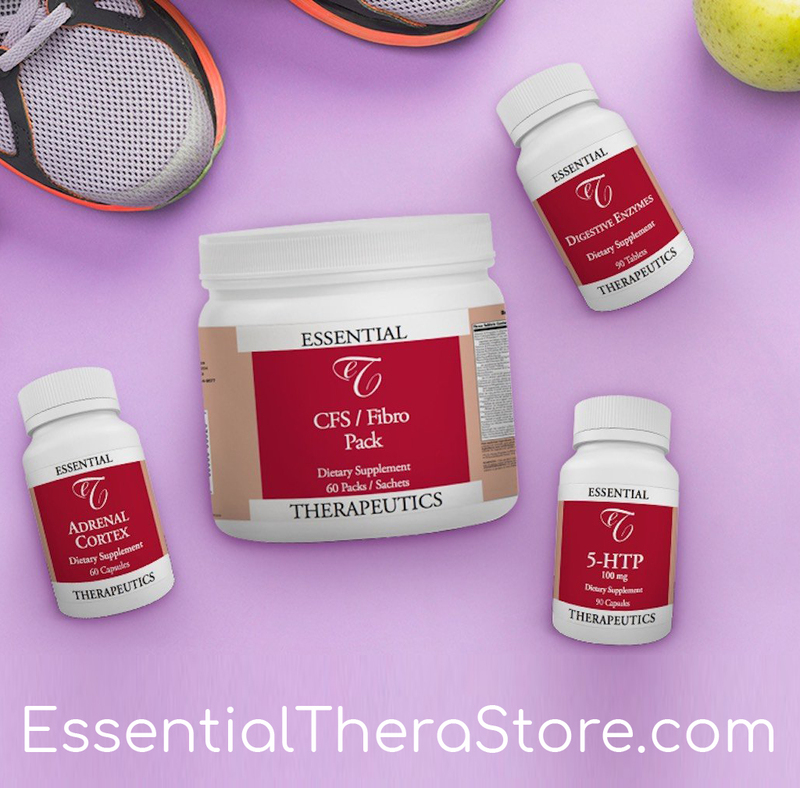 The supplements in this package are essential for reversing fibromyalgia and CFS symptoms, and they don’t take a lot of measuring, counting, or reorganizing of your medicine cabinet. Ninety-nine percent of the time, I start my pain-and-fatigue patients on the four pillars of the Jump-Start Program from day one: 5-HTP, adrenal cortex, digestive enzymes, and an optimal daily dose multivitamin and mineral formula. When my patients begin the jump-start package, they consistently report feeling better within 2–4 weeks. That’s because these supplements help address the core issues of fibromyalgia and CFS. I call these the four pillars, and we begin them all at the same time. This builds serotonin and promotes deep restorative sleep, the most important step in beating fibromyalgia and CFS. See chapter 10 to read all about it, including what to do if it doesn’t seem to be working for you. Once you get sleeping well and restore you serotonin levels, you should start feeling better than you have in years. However, if you don’t repair your sluggish adrenal glands, you’ll crash every time you attempt to overdo it. I know you can relate to having a day or two when you feel good and then overtaxing yourself only to “flare up” again and end up in bed for several days. Supplementing with adrenal cortex (500 mg. daily divided into two doses) and/or other supplements that help the adrenal gland repair itself is a crucial step towards avoiding these flare-ups. Check out chapter 11 again if you’re not convinced. The majority of my patients are suffering from poor digestion, and most are taking antacids or proton-pump inhibiting medicines to block their stomach acids. As I’ve already discussed, this can cause further nutritional deficiencies. If you’re not breaking down and assimilating the nutrients in your foods or the supplements your taking, you’ll be wasting your money and never feel as good as you could. That’s why I recommend that all of my patients take an 8X pancreatic digestive enzyme—or betaine HCl with pepsin enzyme—with each meal. Read more in chapter 12. I’ve already established the important roles vitamins, minerals, essential fatty acids, and amino acids play in reversing many of the most troubling symptoms of fibromyalgia and CFS. After working with fibromyalgia and CFS patients for over a decade, I’m firmly convinced that without taking a good optimal daily allowance multivitamin-and-mineral formula similar to the one I’ve developed, patients are doomed to a life-long battle with poor health. Chapters 26–29 will give you more details about the ingredients in the CFS/Fibro Formula. The CFS/Fibro Formula is taken as one pack with food, twice a day. I’ve designed what I consider to be (and which has proved itself to be) the best on the market, if I do say so myself. This Jump-Start Package is the place to begin in your journey to wellness. Start here, and give yourself some time to improve. As your stress-coping savings account builds up for a couple of weeks, you should definitely feel better. Some of you will show a dramatic improvement. You won’t be totally well yet, and you might never feel like you did when you were 20. But you shouldn’t have to suffer like you have been. Read the book and tried ordering the jump start supplements for fibro…so disappointed that they are on back order until the beginning of April. Is there any other place I can purchase these? Is there any link between Fibro and shaky hands? Could this be cause by prolonged use of an SSRI? Yes could be due to SSRI, numerous meds can cause tardive dyskinesia or the shakes. I came across your website by complete chance and I couldn’t be happier. I’ve had fibromyalgia since 2005, along with chronic fatigue syndrome chronic regional pain syndrome diffuse arthalgia periphel neuropathy tenosynovitis hypo thyroid drop foot (both sides) and chronic anemia and anxiety and depression. Quite a lost for someone that’s 41 years old. Anyway after I had my first and only child in Dec of 2011 everything got so much worse than before I was pregnant. I questioned myself in being able to take care of my baby at all the way I was feeling. I had swelled so bad in my feet and ankles I could hardly walk I couldn’t wear shoes cuz my feet and ankles wouldn’t allow it. I could barely stand without excruciating pain. Ends up that iblost both arches in my feet and the swelling caused liagaments to teat that are no longer visible and 2 forms of arthritis have set in rheumatoid and inflammatory. I’m miserable. I push myself to the point that i can’t even sleep cuz my mind just races on everything I still have left to do. I had to quit my job in 2005 cuz I couldn’t make it on time to my scheduled appts as a nail tech and the chemicals were to much for me to smell. I’ve been a mess and I’d do anything to feel even 20% better. Doctors just don’t take me seriously because I’m not one to carry my pain in y face I always smile and seem happy when inside I feel like I could drop at any given time. So I’ve been lied to out off and mistreated misdiagnosed and I just want to be helped like everyone else is. I have insurance and I have begged for specialists to see me and have a MRI done but nothing. Actually I had one MRI 3 years into all this and only of the right side which is how I knew about the tenosynovitis. My doctor never told me the test results I asked for a copy of the results myself and found out that way. So basically he withheld important information from me. I don’t know why either or why he lied to me that my insurance wouldn’t allow me to see a podiatrist or a orthopedic surgeon. He said that they wouldn’t cover those types of doctors. Which was a complete lie. When I finally called my insurance company almost 9 months later they told me of course they would cover specialists and anything else I needed. So not only was this man lying to me he was neglecting me in a big way and failing to refer me to the proper specialists to get help. Now because of all the time that has past my condition is permanent and I’ll never be who I was before. Ithe fibromyalgia is so bad I hate to even leave the house cuz I’m embarrassed of how I walk incan no longer run at all I’d fall on my face. I can’t rotate either ankle or point or flex my feet anymore. All because some doctor didn’t want to help me for whatever reason. Do u think your treatment would help me in anyway? And also does it help with weight gain? I’ve been having trouble with weight gain and I hardly eat anything its really strange the medication intake isn’t enough cuz I still have all the symptoms I did before. I take levothyroxine 75mcg once a day. Any advice would be greatly appreciated. Thanks in advance. This book has changed my life! After struggling with Fibromyalgia for over 20 years, I’m actually feeling better than ever. Dr. Murphree’s advice is spot on!